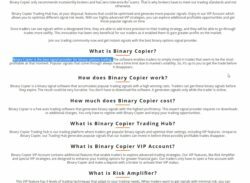 In this review we explain why you should not trade binary options with Binary Copier. 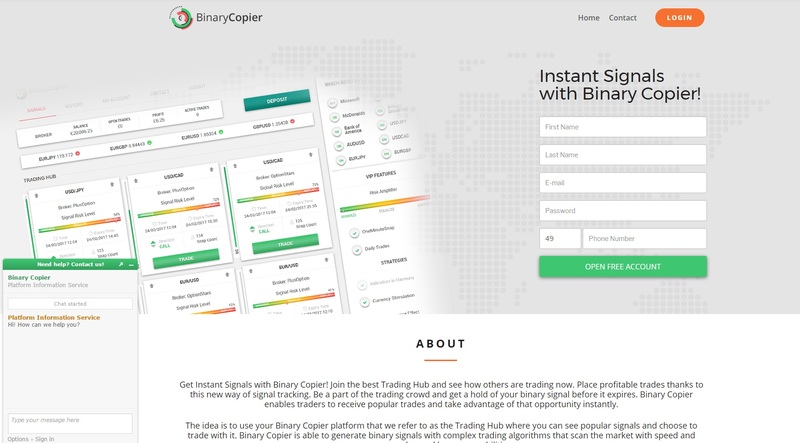 Binary Copier allegedly is the best binary options trading signals provider. The software allows you to copy other traders, which should make you money. And because Binary Copier is free, you allegedly can make money for free. The first thing we noticed about BinaryCopier is that is not a unique software, therefore it cannot be called the best. The same software is used by scams like Trader’s Buddy, Tratika or United Trading. In our reviews we proved that people who run this software are also connected to other scams like Binary Option Robot. And there is a lot of people who lost a lot of money with all these scams. All these trading apps are not transparent, they are run by some anonymous people who hide their identity and cannot show any real trading results. We have to set one thing straight, BinaryCopier is not free. After registering you will be asked to deposit at least $250 with an unregulated broker! The software will not be activated until you deposit. 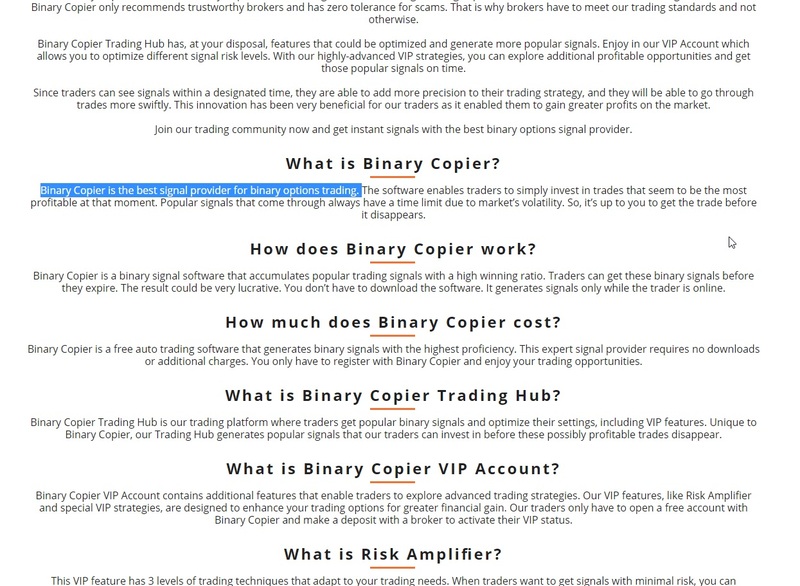 So this is another lie of Binary Copier, you will have to pay in order to be allowed to use the trading software. Which also means that you cannot test it in any way, you have to risk your own money since the first trade, which is extremely dangerous, certainly with an anonymous software like this. Don’t do it! The real aim of Binary Copier is just to make you deposit with a certain broker, because people who run this scam are getting paid by some brokers for referring new depositors. That’s the harsh truth. The software is here just to lure you and make you deposit money with an unregulated broker. If you do it, you are almost certain not to see you money ever again. Binary Copier is a scam that won’t make you any money, it will just take your deposit and lose it. The serious way to making money with binary options leads through testing and learning a demo account with a regulated broker.